TransAsia Airways flight GE235 carrying mostly Chinese tourists has crashed into Taiwan’s Keelung River, killing at least 23 people. The plane, carrying 58 people, has broken up and the fuselage is lying half-submerged in the Keelung River. Rescue efforts are ongoing. At least 15 people have been pulled out alive, with 20 still missing. Television footage showed some passengers wading clear of the sunken wreckage and a toddler being pulled out alive by rescuers. The dramatic moment a toddler was rescued from the sunken wreckage of the jet. Emergency teams have cut the plane open to gain access, attempting to reach the remaining passengers trapped in the front section of the fuselage. “At the moment, things don’t look too optimistic,” Wu Jun-hong, a Taipei fire department official coordinating the rescue effort, told reporters. Wu Jun-hong said the fire department had requested heavy cranes to pull the body of the plane out of the water. 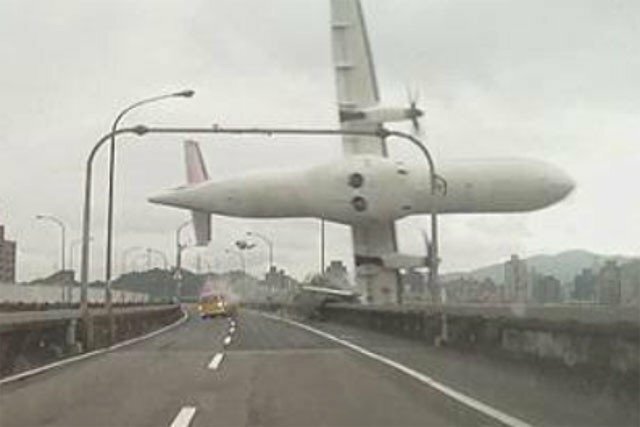 TransAsia said in a statement that one passenger had already been discharged from hospital. The ATR-72 turbo-prop plane had just taken off from Taipei Songshan Airport and was heading to the Kinmen islands, just off the coast of the south-eastern Chinese city of Xiamen. It is the second TransAsia ATR-72 to crash in seven months, following an accident last July which killed 48 people and injured 15. The recording was not immediately verified by aviation officials. “I saw a taxi, probably just meters ahead of me, being hit by one wing of the plane,” an eyewitness told local media. TV footage showed rescuers standing on the tail section of the broken wreckage trying to pull passengers out of the plane with ropes. The majority of the plane, including the front section of the fuselage and the wings, appeared to be underwater. The plane’s flight data recorders, also known as black boxes, have been recovered. TransAsia said it had contacted relatives of all the 22 Taiwanese passengers and was attempting to reach relatives of the Chinese nationals on board. The company’s chief Chen Xinde offered a “deep apology” in a televised news conference, but said his planes had been “under thorough scrutiny” since mid-2014. “Both our planes and our flight safety system are following strict regulations, so we also want to know what caused the new plane model to crash, but I don’t want to speculate,” he said.